Yes, it's epic. Like the first Star Wars movie. Will Luke Page defeat the evil Darth Zuckerberg? Let's keep the jokes aside for a while. It's a big thing. Google basically announced that, what rumors has said for month. But even better. I can't tell you many details, because it's invite only. And I haven't receive an invite from Google until now. But the concept looks amazing. +Circles let you send updates to a certain group of people isolated. 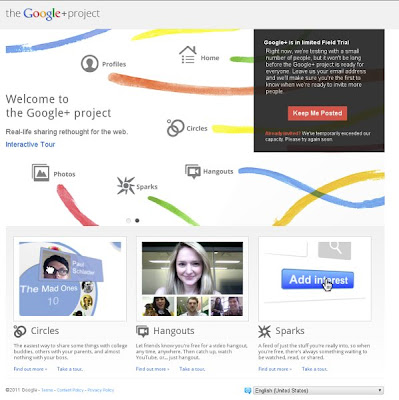 +Sparks to start conversations and share stuff all around the web. +Hangouts for having video chats and meetings. +Mobile to share anything, check-in, location based features. The Android app is already available on the Market. +Huddle for coordinating activities with friends easily. It sounds too good to be true. And yes, we have to wait how this will work out when it's broadly available. And the most important question: Will people adopt it? I really hope so. We need a strong competition to Facebook...finally.